Finally a tool that simplifies the construction of the Diamond Square unit without having to use paper foundation piecing. It is an all-in-one tool that gives you a window template for accurately cutting the center square, a chart printed right on the ruler for the recommended size to cut the triangles sewn to the four sides of the center square and a trim down section on the ruler that simplifies the alignment of ruler to fabric unit and allows everyone to clean up the unit to a precise measurement every time. You can see the tool demonstrated on our free online video demonstration. This unit is a tricky one to get accurate, but with the Square² tool and technique of oversizing and trimming down you’ll have far better success than with any other product on the market. 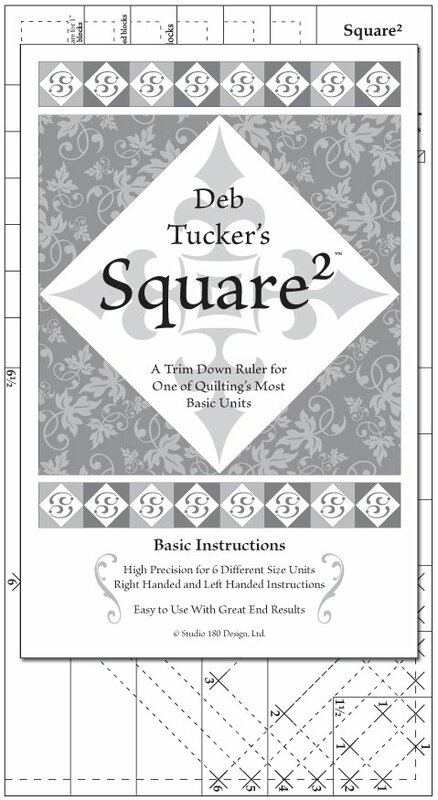 Square squared and Diamond Rects are used to make Storm at Sea quilts. Get your free Storm at Sea pattern by sending an email to barbara@alleycatquiltworks.com with Free Storm at Sea pattern in the subject line. Check out my Pinterest Board Storm at Sea for some inspiration! Stress Free Storm at Sea is one of my most requested classes!